The TUI owned AsiaRooms started life as a 100% operator shop. Accessing net rates from operators such as GTA and Turismo Asia. Many times they were criticised for pricing policies that angered hoteliers but recent comments from marketing head John Fearon indicated they were looking to move away from that pre-TUI reputation. AsiaRooms is part of TUI's Onlien Destination Services Group. I have heard today of another step in that move UPDATE (and this has been confirmed by John Fearon). Here is a screen shot from an email sent out to hoteliers today. It shows that AsiaRooms is moving to a commissionable model with directly contracted hotels at 15%. I am sure this will be a challenging shift. While it may make it easier to contract hotels, setting up an effective accounts receivable department across Asia where none existed previously will be a huge challenge for AsiaRooms. While hotels will be happier with the pricing certainty on AsiaRooms, the commission model shifts the credit card fee and payment transfer cost to the hotel. Here a shot from the email. What do you make of this change? 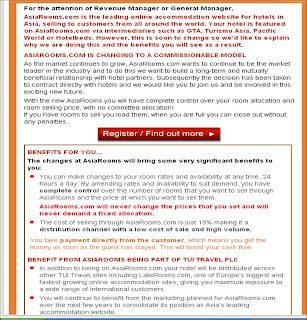 Its true Asiarooms will change its business model in the future. Thanks for your input Vietnam Travel! 2. Increase speed for delivering latest rooms rates / inventory to their customer. however, there are some flaws in this move as well....can u think what they are ?